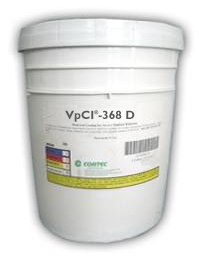 VpCI-368D is an already diluted version of VpCI-368 so it saves time and mixing. VpCI-368D leaves a firm, wax-like film that can be removed by mineral spirits or alkaline cleaners . Typical applications include pipe coating, parts storage, underbody coating, wire rope, steel plate and machined parts. It protects carbon steel, stainless steel, copper, aluminum and cast iron. VpCI-368D may be applied by dipping, brushing or spraying. A film thickness of at least 2-3 mils is recommended for uncovered outdoor storage. Available in 5 gallon steel pails (Cortec Product Code 12300458) or 55 gallon metal drums (Cortec Product Code 12300459). 5 gallon drum weighs 50 pounds and ships under our standard shipping rates. The 55 gallon drum must be shipped by truck. We will provide you with a freight quote before we ship this product.